There’s a new generation of Android smartphones coming in early 2017, and they’re going to charge faster than ever. Qualcomm's all-new Snapdragon 835 processor is being unveiled in conjunction with its announcement of Quick Charge 4.0, the company's next-level recharging standard. Quick Charge 4.0 will be able to eke out 20% faster charging from phones with the new SoC (system on a chip) architecture, compared to current Snapdragon 820 devices employing the Quick Charge 3.0 standard. That’ll get you about five hours of talk time battery life in just five minutes, and it's almost two-and-a-half times as rapid as the original Quick Charge platform from 2013. There was an obvious undertone of caution when Qualcomm unveiled the Quick Charge 4.0 standard alongside the Snapdragon 835 chip. The Samsung Galaxy Note 7 battery explosions and subsequent recall are fresh in everyone's mind, even if Qualcomm didn't have anything to do with the issue. That's why the company was sure to emphasize, re-emphasize and re-re-emphasize its 'Comprehensive Quick Charge 4 Safety Enhancements', with multiple levels of protection at all layers. 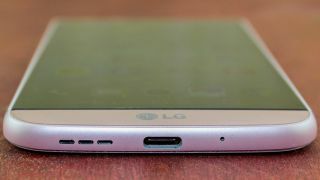 This means the new charging standard is monitoring the battery, system, cables and connectors during the rapid recharge phase, according to Qualcomm. With a goal of fast-charging with more USB-C chargers across the board, Snapdragon 835 and Quick Charge 4.0 are also supposed to end USB-C overcharging issues. Cheap cables that draw too much power and fry devices won't be as much of a problem. Which phones will get Snapdragon 835? Qualcomm didn't, however, get into which devices will support Quick Charge 4.0 or its new Snapdragon 835 processor. It's simply teasing that follow-ups to current Snapdragon 820 and 821 phones will be able to harness the power of the new chip and charging standard. Qualcomm did tell us that the SoC is going to be smaller than ever at just 10nm, making it the first mobile processor of its size and requiring less power. All of this means we're likely to see new phones with better battery life performance, such as the LG G6 and Samsung Galaxy S8, in early 2017, when the new chip and charging platform are set to launch. Ready for our CES 2017 coverage? It's almost here.